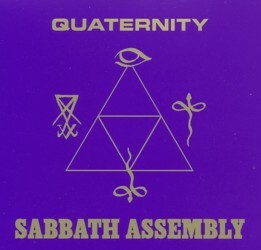 The third full release from the enigma that is Sabbath Assembly, ‘Quaternity’ is very much a game of two halves. The first side in LP terms features four tracks (and an intro) which are pretty much self-contained and self-explanatory – or are they? – in content: ‘The Burning Cross Of Christ’, ‘Jehovah On Death’, ‘I Satan’ and ‘Lucifer’. The self-confessed aim of the core members, both of whom have studied the hymns of the Process Church of the Final Judgement, is “to provide moving and transformational music for the current generation… Neither good or evil can be fully repressed and therefore embracing both sides in balance brings the most satisfaction and peace.” In support of this stance the compositions (it sounds peculiarly undefined just to refer to them as songs) weave a tapestry of light and dark, good and evil, and provide that balance in relation to the four characters depicted in the songs. Such portraits are largely painted in acoustic form with vocalist Jamie Myers and percussionist Dave Nuss joined and supported by a cast of special guests including guitarist Kevin Hufnagel from Gorguts who gets to earn his stripes in the heaviest cut: perhaps unsurprisingly, ‘I, Satan’ boasts a monster riff and some wholly malevolent guitar work. The final composition (or second side of vinyl) takes on another four characters, ‘The Four Horsemen’. Part song, part story; part hymn, part paean, an edited version of ‘The Four Horsemen’ was released as a limited edition single last year, but in its full form it sprawls over twenty-plus minutes, blending bells, chants and acoustic and electric guitars in a huge celebration of Armageddon . At times it does seem to meander like a river as its themes ebb and flow, but there is an underpinning sense of purpose which time and again draws it back to its destiny. “We hope you find this music and these ideas inspiring,” Myers and Nuss suggest. ‘Quaternity’ is a certainly that. A stimulating and unique offering, in parts both sublime and malign, it’s an album which challenges pre-conceptions: but it is inspiring – no question of that – and ultimately satisfying.